In my last blog I promised I’d share more from our recent trip to the Uists and Barra. So here I am back, this time to take you on a virtual tour of the Hebridean delights that are Barra and Vatersay. The morning after ‘blowing a hoolie day’ we woke to no wind and were delighted. Yay – it meant we could take to the seas for an island hop to Barra and Vatersay. We were Eriskay bound once more. This time to catch the ferry to Ardmhor Bay on Barra. Unlike our drive to Eriskay the previous day, we had plenty of petrol in the tank and our journey was niggle free. The boy loves a CalMac ferry trip so he was delighted when he spotted the boat. As we sat in the car waiting to board a cyclist and biker queuing behind us struck up a conversation. I say conversation but we could only hear one side of it. I can only assume the biker had been rendered deaf by the constant roar of her motorbike engine. For 15 minutes she shouted her way through the conversation at the top of her voice. I could feel my eardrums vibrating and I wanted to open the car door and scream “STOP SHOUTING, we came here for tranquillity!” I pitied the poor cyclist who’d unwittingly stumbled into conversation with her. Once on-board we kept a close eye on Shouty McLoudmouth to see where she’d sit. Once she’d settled we headed in the opposite direction. The coach-load of people we sat beside were far quieter. They made a big fuss of the boy who lapped up the attention, making lots of new pals. Once on Barra our first destination of the day was to visit one of the World’s most unique airports. There are daily scheduled flights to Barra from Glasgow International Airport. The tiny Twin Otter plane that flies there can carry 18 passengers, plus a crew of two. What makes Barra Airport unique has nothing to do with the dinky wee planes that land there, or the fact that the baggage reclaim area is a converted bus shelter. It’s Barra Airport’s runway that makes it a tad unusual. You see, the runway is a beach. You heard right, a beach! It’s the only airport in the World where scheduled flights land on a beach, and the timetable is dictated by the tides. We took the boy on to the beach/runway to let off some stream. Larking about on the sand it felt a bit surreal to think a plane would be landing there soon. I can’t think of another beach I’ve visited that asks you to observe wind socks, and warns there’s a risk of being sandblasted by an aeroplane. As luck would have it we arrived a little over an hour before a flight was due to land. Mr G was super excited, declaring that watching a plane land on the beach at Barra was on his bucket list. An eager crowd of plane spotters soon started to form. It was then that Mr G’s not so rational hungry logic kicked in. 40 minutes prior to landing seemed like an excellent time to grab a take-away lunch from the popular airport cafe, which coincidentally was packed to the rafters. I warned him that the plane often landed a good 10 minutes early, but he was confident he had loads of time. So off he trotted in search of food. Meanwhile I found us a good viewing spot and waited, and waited, and waited for him to return. Anxious I texted him. ‘Plenty of time yet’ he texted back from inside the airport. Then I heard one of the more eagle-eyed spectators shout ‘here it comes’ I scanned the sky and spotted a minuscule dot in the distance. “IT’S COMING’ I texted. Mr G ticked watching the plane land on the beach at Barra off his bucket list that day, but only by the skin of his teeth. He arrived at my side like a bat out of hell, seconds before the plane touched down 20 minutes ahead of schedule. Our lunch of toasties, coffee and home baking was delicious. It’s easy to see how the airport cafe has acquired such a great reputation. We hung around to watch the plane depart for Glasgow and I wished I wasn’t such a coward when it came to flying. Will I brave it on-board myself one day? Who knows. This blog has led me to try out many weird and wonderful things so maybe, just maybe. After plane spotting we headed to Castlebay, Barra’s main settlement. The settlement is clustered around a bay which has a striking, medieval castle sitting in it. Kisimul Castle ‘castle in the sea’ is the ancient seat of the chief of the Clan MacNeil and the only significant medieval castle to have survived in the Western Isles. In March 2000 the 46th Chief of Clan MacNeil leased Kisimul to Historic Environment Scotland for 1,000 years. The rent? £1 per year and a bottle of Talisker whisky. If only I’d known I’d have offered double! We pottered around Castlebay for a while, but as we were visiting on a Sunday everything was closed. It was actually really nice and peaceful. Although I’m not religious, I like that the Western Isles have managed to preserve a way of life that they value. The boy had been good as gold so he’d earned himself more beach time. This time we found him an aeroplane free one on Vatersay. The Isle of Vatersay is connect to Barra via a causeway. It’s a stunning, unspoiled island and the perfect escape to get away from it all. We had a choice of two beaches, separated by a narrow strip of land. East or west? Turns out the decision was easy. The machair behind the west beach was dotted with cows. I love cows, but since reading stories of them chasing or even trampling walkers I avoid them like the plague on walking routes. The East Beach which sits on Vatersay Bay was absolutely stunning – a truly perfect spot. The handful of other people on it made it choc-a-block by remote Scottish beach standards. Undeterred by the ‘crowds’ the boy cut loose and zoomed around like a wild thing. The look of joy on his face is unmistakable when he’s running at full pelt along a nice sandy beach. I mananged to coax him to sit still just long enough for some photos beside the gorgeous turquoise sea, before he was off again sniffing for beach treasures – sticks, abandoned balls, stones and seaweed. You may hear me refer to the machair from time to time and wonder what it is, so let me enlighten you. The machair is a rare, bio-diverse coastal grassland. 70% of the World’s 19,000 hectares of machair is found in Scotland. Certain farming practices, and climate change over the years have put it at risk but thankfully steps are now being taken to conserve and protect it. These include the reintroduction of seaweed as an organic fertiliser and the installation of machair nets like the one below to halt the spread of erosion. After exploring the East Beach we headed back to the car. The cows were going nowhere, so any thoughts I’d had about visiting the West Beach too were quickly abandoned. Spotting a cow by the car park Mr G shoved his camera in it’s face. Snap – It didn’t look overly impressed and started coming towards him, head down! Told you so I thought! “One day you’ll get trampled for ignoring my advice” I added unable to help myself. We left Vatersay passing cute scattered cottages and sheep lying lazily by the roadside. Back on Barra we drove around, stopping from time to time to take photos. Barra is a beautiful island with a rugged landscape. It’s an island of crashing waves and turquoise sea. It’s also an island of pretty cottages just crying out to be photographed. The kind of cottages that make you long for island life and a lengthy stint away from the mass consumerism and 24/7 lifestyle of the rat race. Later, waiting at Ardmhor Bay to catch the ferry back to Eriskay I spotted Lewis artist Iain Brady’s wonderful otter sculpture. For me, it perfectly captures the spirit of those coastal creatures which mostly elude me. Our crossing back to Eriskay was clear and calm. I watched the sea bubble as the ferry cut through the water. It looked so inviting, like a giant jacuzzi. I know I rave endlessly about the colour of the sea in Scotland, but look at that water! As Eriskay came into view everyone stood staring, quietly contemplating the beauty of the place. We sailed past an isolated house, clinging to the coastline. No nosey neighbours to put up with for those guys. As we drove north I felt a little sad knowing we’d be leaving the next day. I’d miss the Hebridean landscape of peat bog, and the familiar sight of peat stacks piled high, ready to heat homes through the winter. I’d miss the landscape of lochins and rocky hillsides, the remote sandy beaches, rolling dunes and the wildflowers of the machair – I’d miss the Outer Hebrides. That evening, as we did on the other evenings of our stay we ate at the dog friendly Lochmaddy Hotel. It had one of those rare menus that I like lots of things on. I didn’t manage to work my way through them all during our trip, so it seems I have as good as reason as any to return to the Uists. After dinner we wandered around Lochmaddy. It was a beautiful evening and golden hour was beginning to envelop the landscape, giving it a rich amber glow. It looked like the kind of evening that would provide a good sunset, so we headed to Sollas Bay near our B&B to watch and wait. We were rewarded for our patience with a sunset. Not burning orange like the most dramatic ones I’ve witnessed on my travels, but subtle like a watercolour painting – it was lovely. With so many things to do in the Outer Hebrides time spent there flies by, despite the tranquility and realxed pace of life. And so our Hebridean adventure drew to a close. Fabulous as ever, Sam. Great photos and a few memories jogged for me as I’ve visited the Uists and Barra often. We might start a bidding war for Kisimul Castle if we’re not careful! Thanks as always. Thanks Graeme – whoever wins the bid has to allow the other regular break at the castle. Thank you for the lovely mini vacation. Have always dreamed of touring Scotland and Ireland but am too old now, so I find your travels and photos very pleasing. Thank you and give the wee dog a belly rub from a family with three wee white dogs! Another great post! I love the paint scheme on that Twin Otter, too. Thank you – the plane’s great isn’t it – very Scottish. I have been to Scotland several times but now realized how much more there is to see. Love following you on your travels and hopefully will be able to actually visit again soon. I so love that part of Scotland. Oh to be there now, away from everything, breathing in that fresh sea air. Another excellent account of your travels! The stunning photographs reflect the wonderful peace, tranquility and remoteness of Barra and its surrounding islands; a community worlds apart! It was great for me to revisit these sights of a holiday enjoyed on Barra and the Uists some years ago. Thanks so much, Sam. 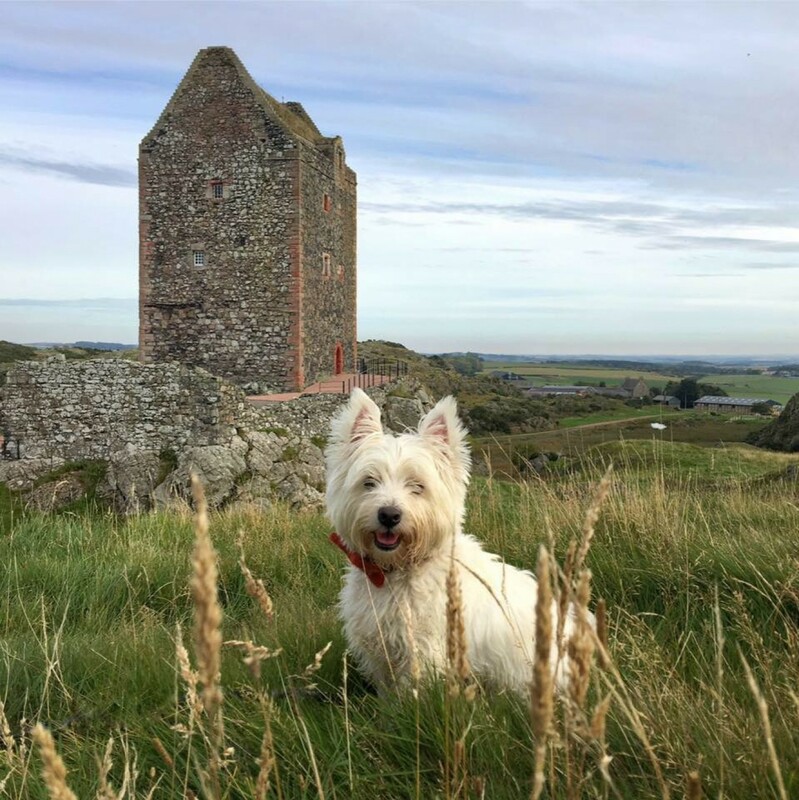 Captain Caspar once again added his distinctive paw-print to the whole blog – what a star he is – and certainly doing more than his bit for Scottish Tourism! Any chance of production of a ‘Visit Scotland’ calendar featuring twelve cute different coloured bow-tied images of the Wee White Dug using your lovely photographs? I have told many of my friends about your great Scottish blog and would love to buy them copies to brighten up their kitchen/office walls. Many thanks to you, Sam, Mr. G, The Teen – and, of course, The Wee White Dug, Caspar – for providing these regular postings that brighten up the days when we’re not all able to experience the Scottish experience in person! Go for the flight, you won’t regret it. One day when I feeling brave I’ll do it. If I can cross the Atlantic it should be a piece of cake. That flight from Barra to Glasgow was the scariest flight of my life! We took off when it was “a wee bit blowy”. Hubby had claw marks on his left leg for days from me holding on so tightly! Adore Barra and the Uists though, and we too have fond memories of the food at the Lochmaddy Hotel. You’re brave to have got on it. I heard a story once about a passenger who was so traumatised by the flight that he tried to open the door when the plane was landing. Apparently he thought it was crashing! We loved the menu and the food at the Lochmaddy Hotel. Love your blog with lots of local information & the photos especially those with Casper posing! It certainly makes me feel I want to visit these places for myself. Only wish I had a wee white dug to accompany me. Thank you for sharing both here & on Facebook. Keep up the good work for Scottish Tourism & we armchair followers. Thank you so much. I’m glad you enjoyed your tour. My blog would be pointless without my wonderful armchair followers.